Take a beautiful walk down the shady path to the ledgerock shoreline on Lake Superior. Minne Me is a quaint vacation rental cottage on Lake Superior`s North Shore. Lake Superior`s shoreline is just a short, gradually sloping pathway away from Minne Me`s deck. Roughly 100 feet away from Minne Me you will find yourself on your own private section of Lake Superior shoreline. Minne Me features a private section of ledge rock beach. The living room features a vaulted ceiling and large windows, making this small cottage feel spacious. Windows on three sides of the living room allow you to enjoy the Lake Superior and forest views. Minne Me now features a gas fireplace- great for cool summer nights. There`s plenty of seating for everyone in Minne Me`s living room. The room also features a small dining table, great for two. The peek-a-boo views of Lake Superior can be enjoyed through the large living room windows. The kitchen is small but well equipped with everything you would need to prepare a meal during your stay. Enjoy views of the wooded surroundings while you prepare meals. The main bedroom has a queen bed. Note that the bedrooms in Minne Me are separated by curtains, not doors. The second bedroom has two twin bed- great for kids This bedroom is also separated from the rest of the home by a curtain. The bonus office/sitting area features a day bed and desk. This is a great bonus room for anyone needing to do work during their time at Minne Me. The bathroom features a shower/tub combo. The lake-facing deck is a great place to enjoy an outdoor meal on warm summer days. Just hop down the steps and onto the path down to the beach area. Or just sit back on the deck and enjoy these great views of Lake Superior. Minne Me, as seen from the front, is a cozy 2 bedroom, 1 bathroom cabin located on Cascade Beach Road in Lutsen, MN. Just over 100 feet away you will find Lake Superior`s shoreline. Enjoy great views and plenty of privacy. The Lake is visible from the home, but the views are even better once you get down to the beach Looked east you will have one visible neighbor if they happen to be on the beach at the same time. Otherwise you will get plenty of privacy here. Looking west your neighbors are blocked by the ledge rock. A peek-a-boo view of Minne Me from the shoreline. Nothing but trees and Lake Superior for as far as the eye can see. This picture gives you an idea of the distance between the home and the lake. Another shot showing the distance between Lake Superior and Minne Me. Head on down Cascade Beach Road and turn into Minne Me`s driveway. Then you`ve arrived at your North Shore Home Away From Home. Located on coveted Cascade Beach Road, Minne Me is a cozy cottage has great Northwoods charm. Set on a lot full of beautiful old cedar trees, the shady path leads to a Lake Superior ledge rock shoreline perfect for sitting and dreaming. It's a moderate path to get down to the lake. Many a memorable vacation has been enjoyed at Minne Me. 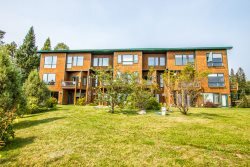 Settle into this quaint two bedroom, one bathroom, one-story cottage located in the heart of Cascade Beach Road for your next North Shore getaway, and find yourself in a peaceful and serene setting that is centrally located. The cottage is smaller but has everything you need to sit back, relax, and enjoy escaping the hustle and bustle of the real world. The great stone wood burning fireplace is the focal point of the living room and a great place to curl up on a cool summer night and friends and family. At Minne Me you are conveniently located just up Highway 61 from downtown Lutsen and only 5 minutes to Superior National at Lutsen Golf Course and Lutsen Mountains Ski and Recreation Area, which offers many activities in the summer months including an alpine slide and sight-seeing gondola to the summit of Moose Mountain. Take a short drive up the shore to Cascade River State park where you will find an enchanting waterfall after a short, easy hike. You are close to many dining options including the Lakeside Dining Room and Poplar River Pub at Lutsen Resort, Moguls Grille & Tap Room at Caribou Highlands, and Papa Charlie's Restaurant & Tavern at Eagle Ridge Resort. All of which features live music from popular local musicians throughout the year. Grand Marais is just a 15-minute drive up the shore where you can spend a day shopping and dining in the town's many unique shops and restaurants while enjoying a hike out to Artist's Point or just a stroll around the Harbor. Whether your goal for your trip to the Northwoods includes adventures like hiking and biking along the Superior Hiking Trail, golfing at Superior National at Lutsen, or just resting a relaxing at home, Minne Me can be your North Shore home away from home. We rent a lot from Cascade rentals and never are disappointed. Once again we where very pleased by this rental home. Plenty of room for us and our daughter. Very clean and homey. Good location, not far from Grand Marais. very quiet and a nice view. Lots of windows so you could be in or out side to enjoy it. Would definitely recommend it to anyone. We enjoyed the size of the cabin. It was very comfortable for three people. We liked the rustic charm, but it had the necessary amenities. We found the kitchen was quite large and easy to prepare meals. The Cabin was incredibly clean, and the location was great. The cabin was well stocked with everything we needed to cook a nice meal. When we got into Tofte to check in, I liked the low effort needed to get the key and everything we needed. The cabin had an incredible view of lake superior too!